SANTA RITA, Guam - From the moment he noticed a family in distress, to the moment an unconscious child lay on the floor in front of him, time did not exist. Inside a floral shop in Haganta, Guam, the sounds of crying and incomprehensible speech filled the room. Though they could not understand English, he used gestures to assure the family that he could help. He examined the child’s body; no signs of breathing. He placed two fingers on his neck; no pulse. With his palms sweating and his heart pounding, he got down on the floor. He leaned in, gave two short breaths of air, and then began chest compressions. Machinist’s Mate (Auxiliary) 2nd Class Chase Slicer, assigned to the submarine tender USS Frank Cable (AS 40) and native of Vacaville, Calif., used his Navy training to save the life of a child he didn’t know. Slicer was in his car at a red light at approximately 4 p.m. Dec. 12, 2016, and saw a family behaving frantically as they carried a child into a floral shop. Slicer’s intuition told him something was wrong, so instead of continuing on through the stop light, he made a U-turn and went to investigate. He walked into the shop and the employees told him the child was not responsive and they asked if he could help. “Going into the room in uniform, people instantly look to you as a figure head,” said Slicer. About 30 seconds after beginning chest compressions, the child’s eyes began to open. Slicer placed two fingers on the child’s neck and was relieved to feel a settle beating pulse. Moments later, a Guam police officer appeared on the scene. Shortly after, paramedics appeared. Slicer informed them of his actions and they took over from there. Capt. Drew St. John, Frank Cable’s commanding officer, said he was glad to know that Slicer did not hesitate to react when he saw someone who needed help. Slicer said he hopes his actions can be an example for his shipmates and other Sailors in the fleet. On Friday Jan. 28, Capt. St. John awarded Slicer with a Navy and Marine Corps Commendation Medal for his bravery and swift action. As Slicer took the stage to receive his award, he received a standing ovation from a crowd full of his shipmates. Though he appreciated the response from the crowd, it didn’t compare to what he received as he left the scene on that December night. 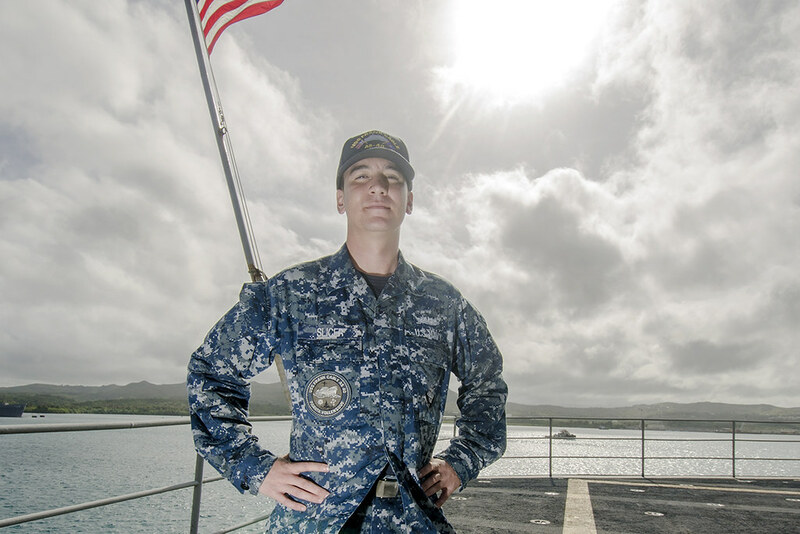 Frank Cable is forward deployed to the island of Guam and conducts maintenance and support of submarines and surface vessels in the 5th and 7th Fleet areas of operations.